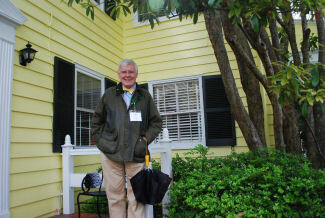 At any rate, we each grabbed a little rain jacket and headed out the door for Kendall Grove near Eastville, only 5 minutes from Blue Heron’s Machipongo office, the first of three homes we planned to tour. 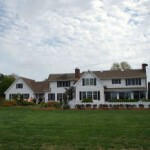 Located on simply spectacular four acre waterfront point overlooking Mattawoman Creek, Kendall Grove is of a distinctive Eastern Shore architectural style called “Big House, Little House”, which as the name says involves the main house and several smaller additions. 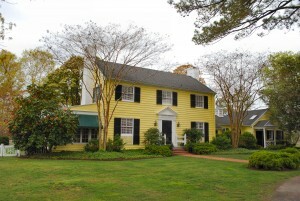 In the case of Kendall Grove, this has resulted in a very pleasing home with numerous rooms, each of which offers a unique view of the gardens, the shoreline and the wide blue waters beyond. 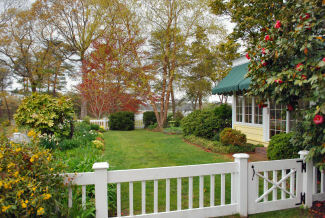 I thought that one of the nicest rooms was the large sunroom which overlooks a pretty little garden enclosed with white fencing, a very serene room where one could sit quietly, reading a good book and just enjoy the relaxed feel of the surroundings. 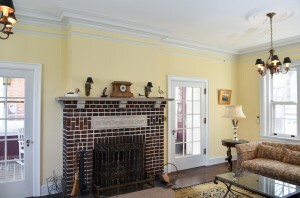 It goes without saying that this cheerful yellow home is very tastefully furnished, with an interesting juxtaposition of American and African art. 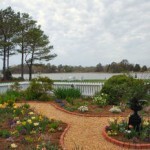 The grounds were lovely, creatively shaped flowers beds abounding, a pool overlooking the inlet and one of the tallest camillia bushes I have seen, which was just blooming its heart out for Garden Tour Day ! 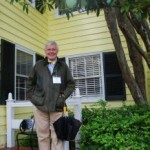 As we were leaving, we stopped for a moment to chat with a fellow on the back porch who turned out to be none other than Tayloe Murphy who served for many years in the Virginia House of Delegates, served as Virginia’s Secretary of Natural Resources under Governor Mark Warner and was a real motivating force behind the passage of the Chesapeake Bay Protection Act in Virginia, a venerable gentleman indeed. 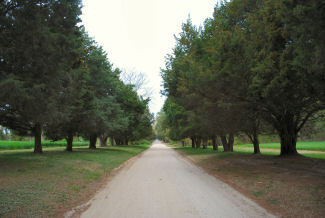 From Kendall Grove we slipped south a few miles to Eyre Hall, listed on the National Register of Historic Places and well as being a Virginia Landmark. 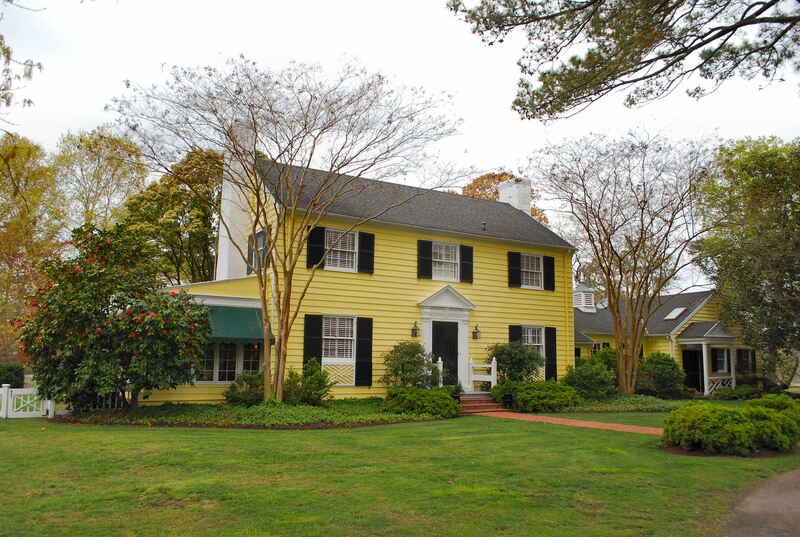 At the end of a long, long driveway, bordered by huge cedar and crepe myrtle trees, is this amazing house, circa 1758, built on the shores of the famous Cherrystone Creek. The current owner is an eighth generation decendent of the original owner and has maintained the home and the gardens in mint condition. 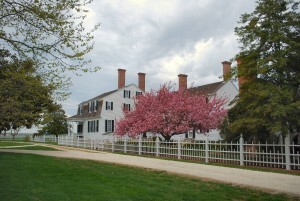 The downstairs, with its extensive collection of period furniture and collectibles, has an almost museum-like quality and includes a framed thank-you letter from General Lafayette to General Robert Barraud Taylor for his kind hospitality on the occasion of Lafayette’s visit to Eyre Hall shortly after the War of 1812. On the way to tour the upstairs we took a quick peek into a little den/library tucked next to the kitchen, outfitted with a comfy sofa, a little TV and a wall of books. I love reading and I love looking at other people’s books, I think seeing what other people read is quite interesting and says a quite a bit about a person. This library contains, among many others, a great many books on southern architecture as well as landscaping, not unexpected considering that Eyre Hall and its extensive gardens can be counted among the finest in Virginia. 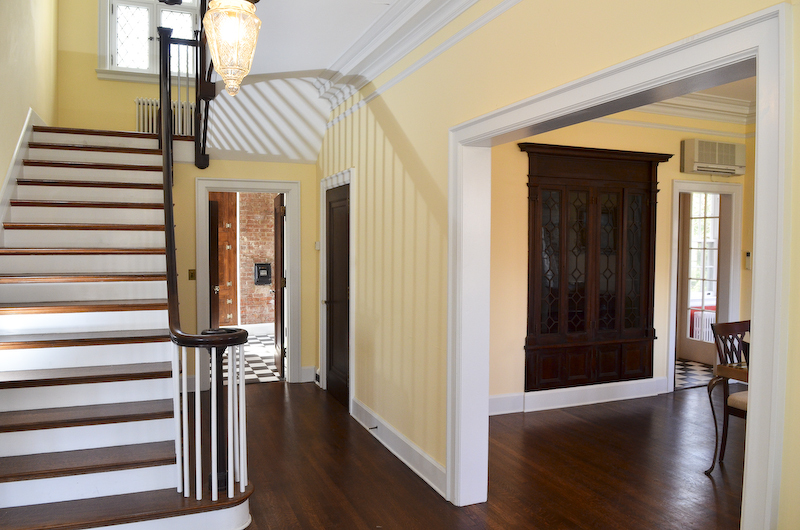 And I loved the upstairs– such a contrast to the very, very formal downstairs, vivid bedrooms with descriptive names like the “Green Room” and the “Lavender Room”, complete with colorful bathrooms to match. It struck me that seeing the upstairs was sort of the Virginia gentry version of being able to see the family quarters of the White House after touring the State Dining Room or the Oval Office ( maybe not a great analogy but it felt a bit like that.) 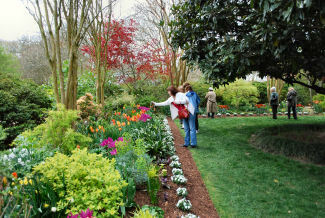 I would be remiss not to say that the formal gardens, which have been maintained continuously since 1800, are absolutely spectacular, a multitude of small gardens and beautiful plantings separated by almost ancient boxwood borders. The ooh’s and ah’s of visitors, many taking pictures of especially interesting specimens, were audible everywhere. 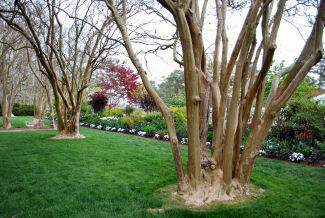 Eyre Hall’s gardens are so extensive you really must see them to appreciate them. 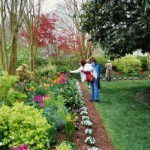 According to the official brochure, this is the seventh decade that Eyre Hall has been the centerpiece of the Eastern Shore of Virginia Garden Tour, so try to come next year and see its beauty for yourself. From Eyre Hall we headed north to Onancock, our last stop of the day, but first a bit of sustenance at Mallard’s On The Wharf, an excellent local bistro located in the historic Hopkins General Store building. They were, of course, jammed but we managed to get a nice table upstairs overlooking the water and enjoyed a most pleasant lunch of clam chowder with an excellent crabcake sandwich, ( all crabmeat, no fillers, as owner Johnny Mo likes to point out ). After lunch we headed out for Bellevue on Onancock Creek. Fortunately, the weather was still holding out- skies were overcast but no sign yet of any rain, I was so happy for the owners who had so graciously opened their homes for this charity event. I can’t even imagine how I would feel about hundreds of just in from the rain, dripping wet visitors walking through my house ( of course I’m sure they put carpet protectors down but still, rain doesn’t make the best situation). 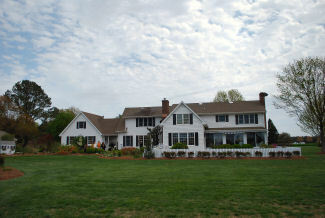 Built on the shores of Onancock Creek in 1978, Bellevue was one of the most recently built homes on the tour and included a charming pool and pool house. It is a good example of how a modern waterfront home can have two facades- the home as it faces the street presents as a lovely Colonial home but on the water side its many large windows enable the owners to enjoy many fine views of their dock and the broad saltwaters beyond. 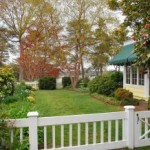 The large sunroom overlooks a fenced perennials garden with criss-crossing walkways and an especially attractive gate. 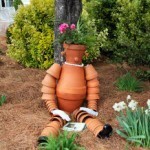 A family graveyard sits close to the pool house whose path is guarded by a very creative creature fashioned from old clay flowerpots. 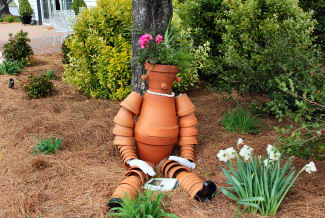 Just before leaving I stopped to take a photo of “Flowerpot Person” and another visitor, who kindly stopped to let me finish the shots, said You’re going to make one of those aren’t you ? 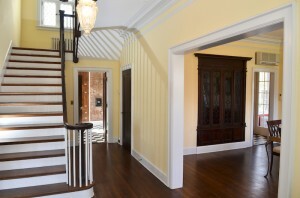 And maybe I will…..
A career in real estate, I can honestly testify, is full of surprising twists and turns. After almost forty years of service to buyers and sellers, I have experienced my share of deja vu experiences, close calls and even seemingly perfect miracles. 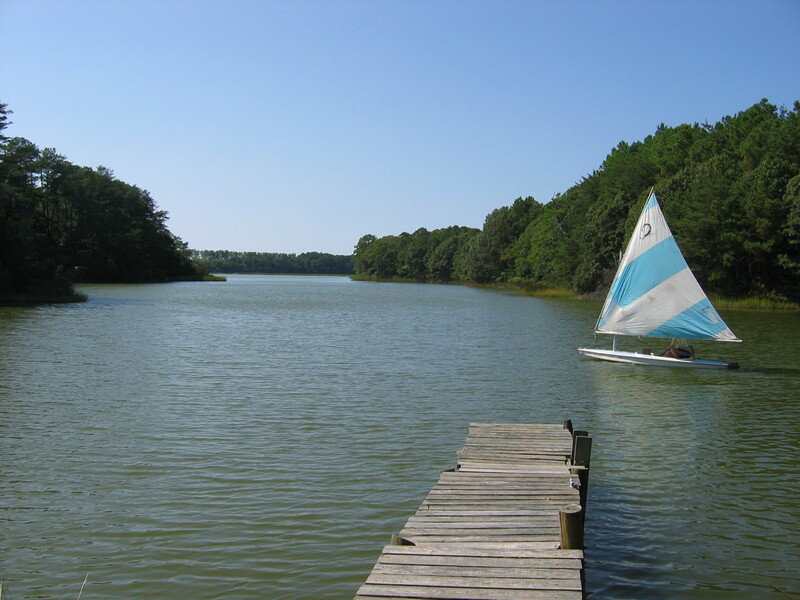 Twenty-five years ago I happened upon the Eastern Shore of Virginia on a lark, a visit during which I made a life altering decision to relocate my children here from our home in Sandbridge in Virginia Beach. I was a single dad raising five children at the time and between my work and my shorthanded approach to parenthood, I felt like I was losing control of my family. Even in idyllic Sandbridge, the big city was eating my children alive, starting with my 18 year old son who was on the verge of turning into a bonafide juvenile delinquent. My discovery of this beautiful rural community surrounded by water appeared to be my ticket to a different lifestyle, a place where I could change the scenery, a place which could revitalize my family life and bring my children closer together under my supervision. Two years passed while I studied the situation on the Eastern Shore, trying to figure out exactly where to move and what I would do for gainful employment. 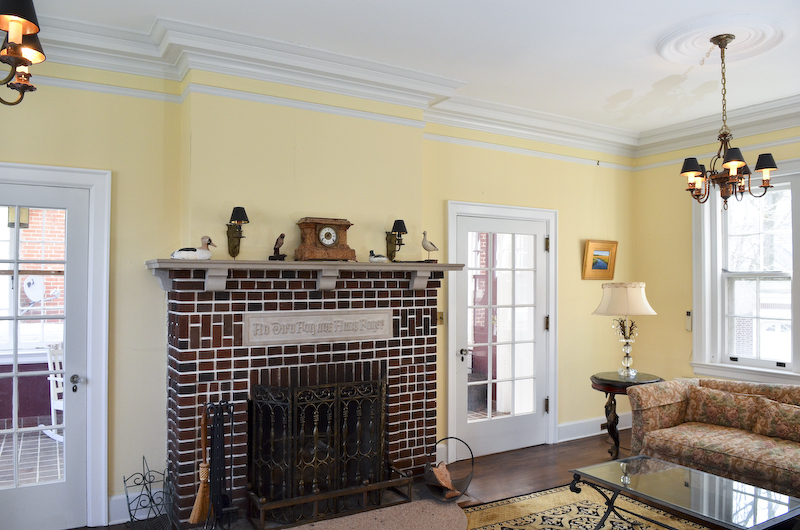 A friend on the Shore phoned in March of 1990 to let me know of an exciting new listing on the market in Cape Charles, the historic Kellogg House, so I made plans to check it out. To make a very long story quite short, it turned out to be the house of my dreams, a true mansion in every respect! Being sold by an estate which was firm on price and terms, I was forced to contract for a purchase with no contingencies. Talk about stepping out in faith, I drove home realizing that if this was meant to be then I would need to sell my home in Sandbridge, sell my business in Virginia Beach and re-establish myself here on the Eastern Shore in Cape Charles. And, miracle of all miracles, it all came together without a hitch ! 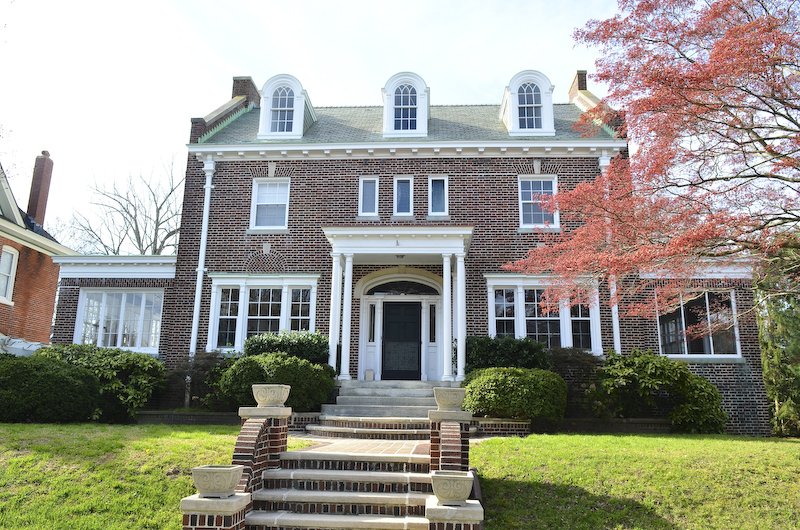 And so we all moved to the big brick mansion at 644 Monroe Avenue in Cape Charles, historic Kellogg House, the wonderful home where all four of my remaining children grew to maturity, graduated from high school and went off to college. I remember packing my last two children, identical twin boys, off to Virginia Tech, dropping them each in their respective dorm rooms and making the long, five-hour drive back home with tears in my eyes. 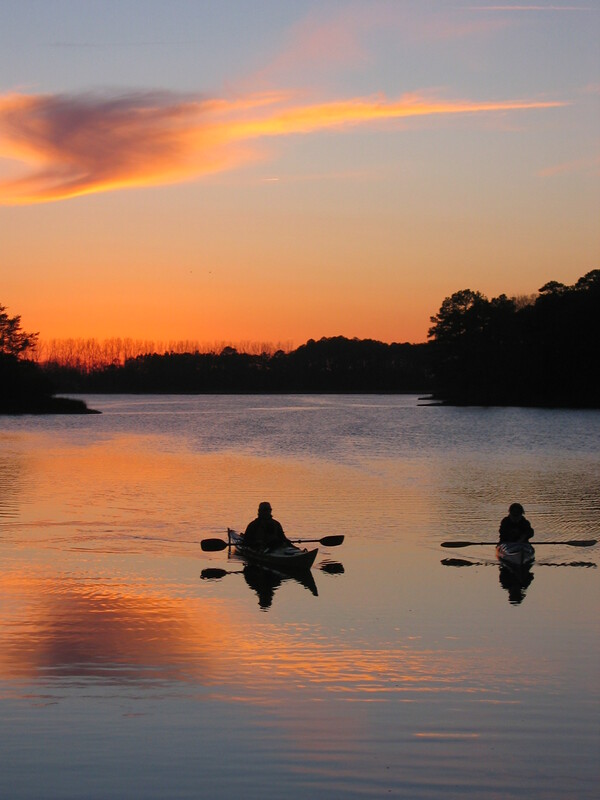 For the next three months I came home from my nearby office selling Eastern Shore real estate to a big, dark, empty, quiet home with no one to talk to, no one to cook for, no one to beg for allowance money. I just about lost my mind while I bounced around this old mansion of a home where childrens’ laughter used to echo off the plaster walls and pounding feet sounded like a herd of elephants running up and down the wide central staircase. Then one day, while out driving on beautiful Church Neck, I happened upon an old gentleman planting a sign in the ground by the road. I slammed on the brakes, threw the gear in reverse and caught the old man before he could get back in his truck. “What are you selling ?” I asked him. 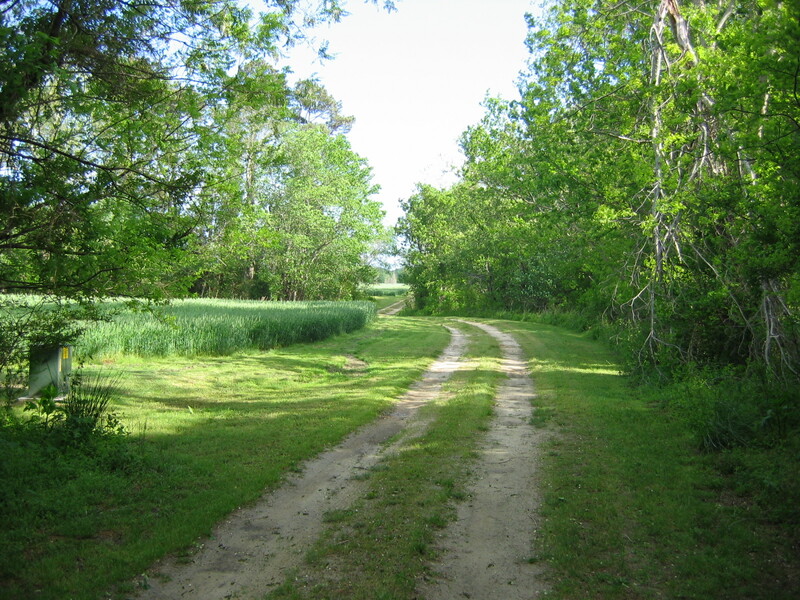 “My house,” he replied, “back there.” He jerked his thumb over his shoulder, but in the distance all I could see was a long, sandy lane disappearing behind the farm fields into the forest. 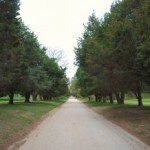 He said to follow him and he climbed back in his pick-up truck and started down the lane. I followed through fields and woods, over hill and dale. We drove a half mile back until we came upon a clearing where I could get a peek at the head of Westerhouse Creek, a colorful saltwater inlet from the Chesapeake Bay. By that time I was completely mesmerized by the beautiful approach to his waterfront home and its wooded setting up high over the lovely little estuary. Both of us dismounted from our vehicles and gazed out towards the water. Could I look at this waterfront property to buy it, I inquired ? 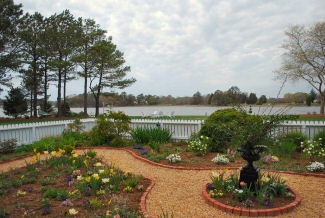 His whole demeanor changed for the better and I took a guided tour beginning with the view over the lovely little cove. 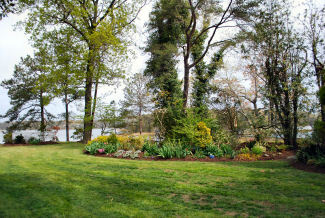 Fifteen minutes later, after touring the cute little cottage, perfectly sized for my new status as an “empty nester”, we were standing between our trucks in the driveway and I asked him how much he wanted for the place – five acres of woodland between a fresh water pond and the salt water inlet from the Chesapeake Bay. He stated a price that I just could not refuse and we shook hands on the deal then and there ! I reached into my briefcase, pulled out a blank contract form, and proceeded to fill it out right there on the hood. We exchanged the pleasantries as I filled in his name on the contract. Some familiarity caused me to pause and look at him, and I said, “You look mighty familiar. Where have I seen you before ?” He looked me in the eye and said, “My picture is in the newspaper every Wednesday with my weekly column.” Then it hit me, I exclaimed, “You’re the Randolph Walker who writes “On the Saltier Side!” Just about choking over this revelation, I stammered, “and I’m buying your house!” For years I had been avidly following his folksy column about retired life out in the Chesapeake Bay countryside. Funny stories each one, about the tug-of-war between his wanting to fish and hunt and his wife twisting him around her little finger to finish the chores. I had salivated at his many colorful references to the waterfront home where they lived, always thinking that it sounded like heaven to me, but I had never known exactly where that place was. 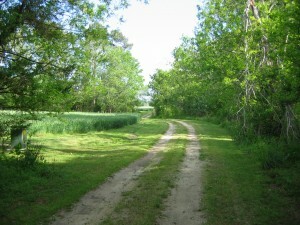 After signing the contract, I headed back out the long, wooded lane towards the paved road. 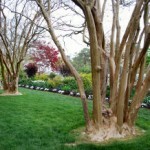 Peeking up at the blue sky breaking through the treetops, reality suddenly hit me – I had to sell my house in Cape Charles !! Don’t you know, it dawned on me that here was another one of those occasions that, if it’s meant to be, it will be. 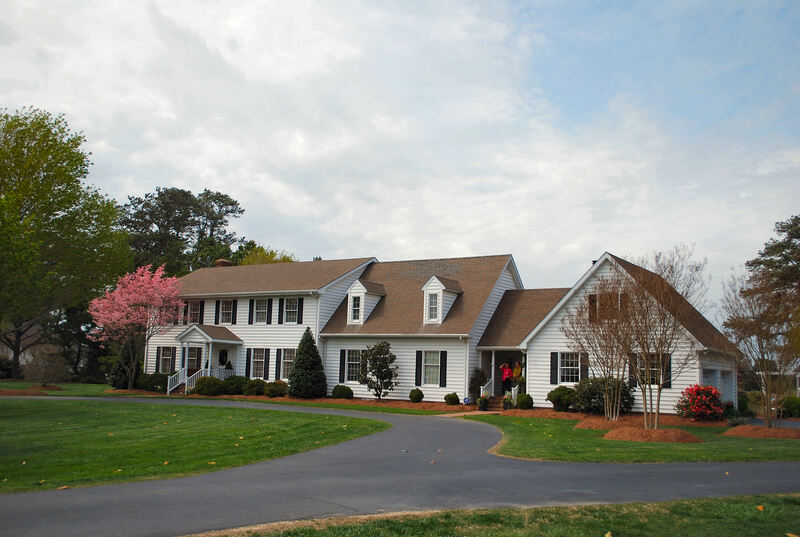 Over the next two weeks, I worked as hard as I could, contracting people interested in Cape Charles real estate including calling a friendly purchase prospect I had shown property to a few months earlier and offering her my big brick home in Cape Charles for sale. And she wanted it! “Thank you, thank you, thank you!” I sang up on high. That was ten years ago, and my life in that cozy cottage on Westerhouse Creek has been even better than I could have ever imagined that day. 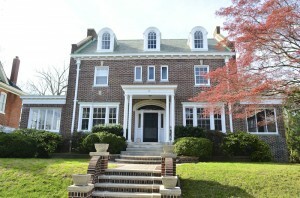 Now, I am back to square one again, with the responsibility of finding another person who will appreciate the lovely historic home on Monroe Avenue as much I did, and as much as my friend did when her purchase of Kellogg House from me helped me to buy my dreamboat place from the writer who stirred my soul. The Palace Theater Presents "Oliver!" The Palace Theater at Night, a Vintage Feel. For those who have never been to the Palace Theatre, it was a very grand art deco style movie theatre when built in 1942, one of the largest and most elaborate between Norfolk and Philadelphia. 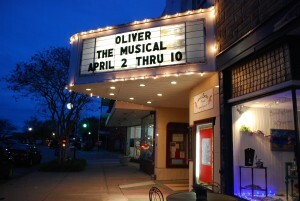 In the late 1990’s the theatre, by then quite run down, was purchased by Arts Enter, an organization formed by a local group of artists and volunteers dedicated to the performing and visual arts. Restoration of this 400 seat theatre was a Herculean task involving raising tens of thousand of dollars for the refurbishment but today it is fully functioning and absolutely gorgeous as can easily been seen by clicking on www.artsentercapecharles.org which has a beautiful picture of the inside of the theatre, with its 38 x 30 foot hand-painted murals, as its home page. 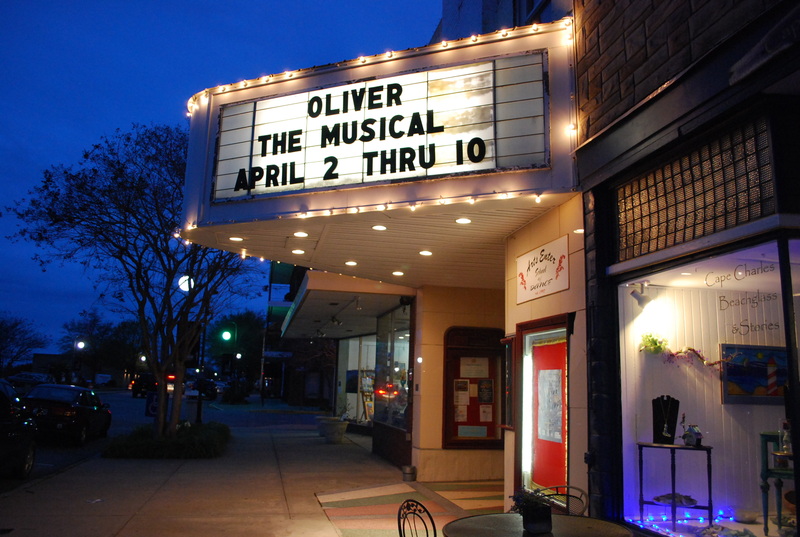 Literally hundreds of dramatic, musical and dance performances have taken place in the revitalized theatre which has been designated a Historic Landmark building and has become the hub around which much of the Northampton County arts community revolves. But back to Oliver ! 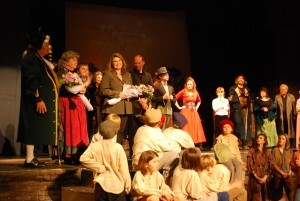 With so many different group scenes, lots of the actors played several different characters or became part of the crowds, including David Kabler from Blue Heron’s Cape Charles office who played in several crowd scenes as well as playing the part of Dr. Grimwig, whose poor advice was responsible for Oliver being kidnapped near the end of Act II . 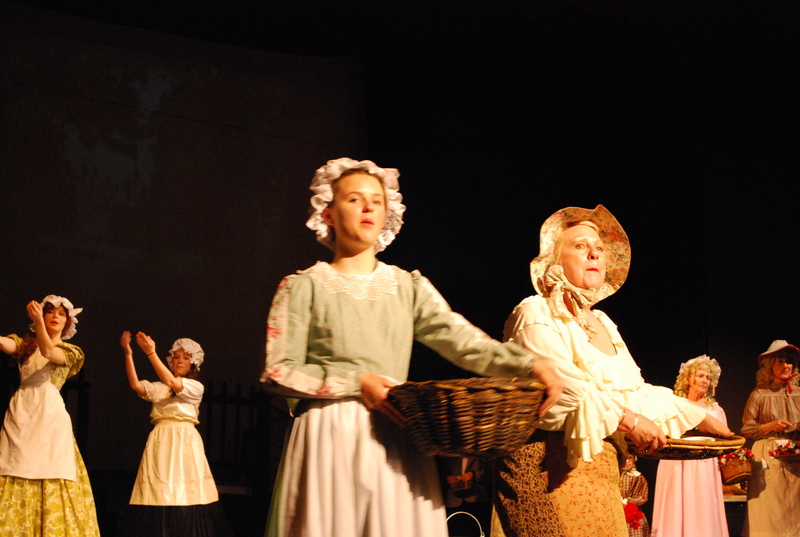 Meadow Noonan, daughter of Eva Noonan from our Cape Charles office, was part of the “thief crowd” and the barmaid group, also looked quite lovely as one of the two Strawberry Sellers in Act II. Susan Kovacs, co-director of the production together with Clelia Sheppard, played several parts including one wearing a salt and pepper colored wig which so cleverly changed her appearance that I kept wondering if it was Susan or not. After the performance I ran into Susan in the lobby and told her that in the wig I just couldn’t decide if it was her or not. We both had a laugh when she told me that her husband, Paul, had seen the play twice but had not recognized her in that particular wig either ! Being a musical, it does without saying that in addition to voice, the underlying instrumental music was crucial to the production. A truly superb performance was given by Art’s Enter’s musical director, Bill Neil on the piano accompanied on violin by Shelia Sheppard Lovelady, daughter of Clelia Sheppard. Oliver ! is an approximately 3 hour long production which means there is a lot of ivory tickling and violin playing — Neil and Lovelady got a well-deserved standing ovation at the end of the show. From the very opening scene to the end of the play, most of the musical numbers also involved substantial and well-done choreography, overseen by Amy Watkins. 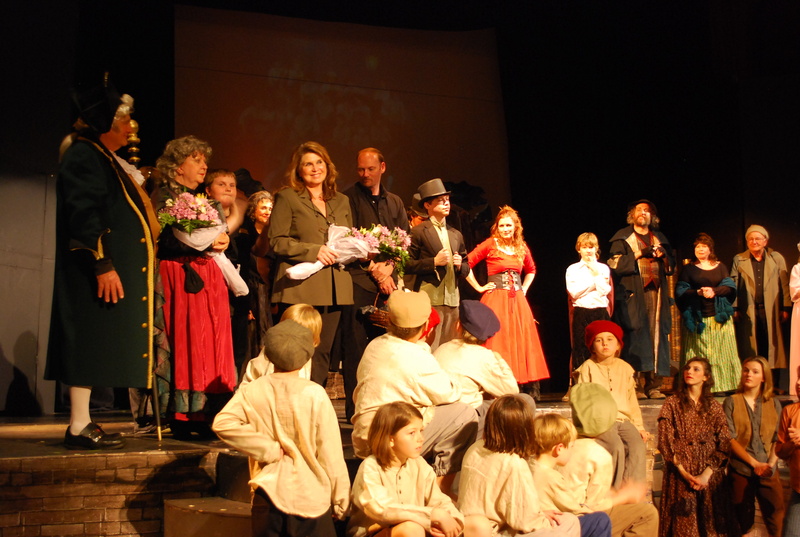 I’m not exaggerating when I say that when the cast came out to take their bows, the applause was thunderous, everybody jumped to their feet to show the many folks who had put in countless hours in rehearsal, set construction and costume creation just how appreciative they were of all that effort, the results of which became another of Art’s Enters’ very successful productions. Can’t wait for the next one. P.S. At the end of the show, Clelia came out on stage to ask the audience to help support Art’s Enter financially by attending the 15th annual “Benefit By The Bay” party, the backbone of Art’s Enter’s annual fund raising, being held this year on June 4th at Mariah’s, a beautiful historic home overlooking King’s Creek. 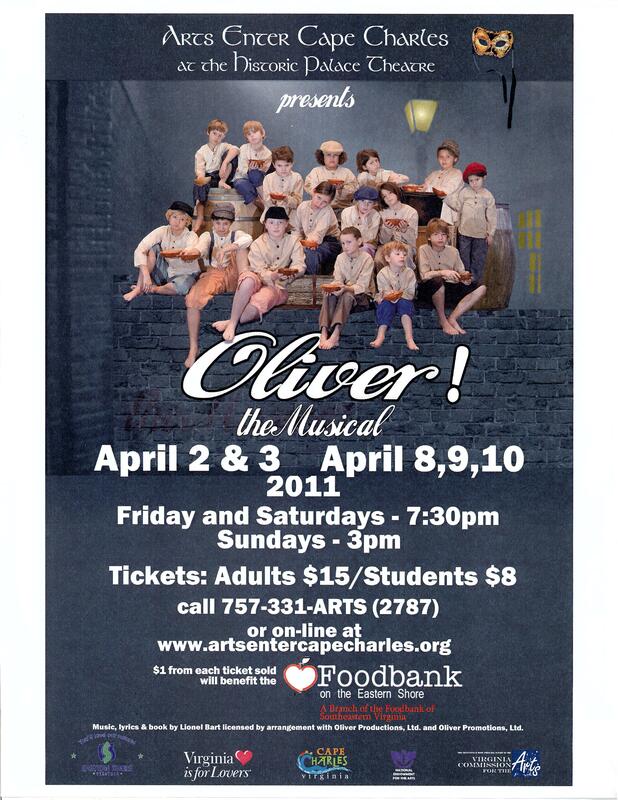 Tickets are still available, call 757-331-3669. Hope to see you there. My husband loves to tease me- he always says that if an event has the word “Fork” in it, I’m sure to be interested. 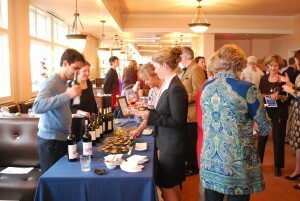 Well, that’s probably true, and especially true for the wine tasting fund-raiser which we attended Saturday evening. Now an annual “foodie” event, “Corks and Forks” this year benefited the truly worthy project of the Hospice of the Eastern Shore, the establishment of the Fragile Heart’s Children’s Camp to help Eastern Shore Virginia children aged 7-14 who are struggling with loss and bereavement, www.hpces.org . 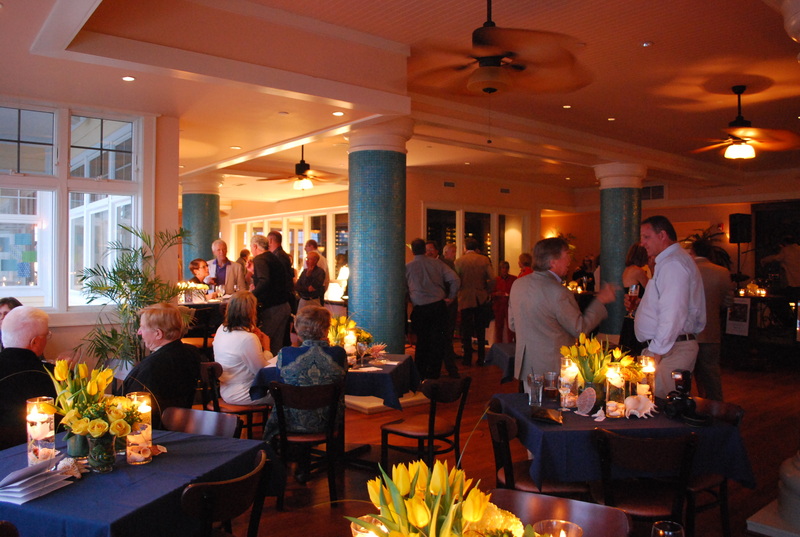 Aqua’s Restaurant in Cape Charles, with its spacious, open layout and gorgeous views from the long wall of windows overlooking the Chesapeake Bay, was the absolutely perfect venue for this year’s event, I don’t think there could have been a better choice. Tables `were beautifully decorated with large candles and bouquets of yellow tulips. Aqua’s nearly full-room length bar, glowing with large bowls of fiery candles floating above large sea shells, (a theme which nicely complemented the restaurant’s location along the sandy Chesapeake shoreline ), served as the MicroBrewery Station as well as the official Cheese Station, which included a particularly delicious Danish blue as one of the selections. Picking up a glass and plate at the entrance, we swirled along with the crowd towards one of the five Wine Stations that had been spread out around the restaurant, offering plenty of room for guests to flow among them, picking up a nibble here and a taste of another wine over there. In total, fourteen different Virginia wines were included in the tastings, with Chatham Vineyards in Machipongo as the Eastern Shore appellation’s contribution to the evening, with owner Jon Wehner serving as the event’s wine consultant. 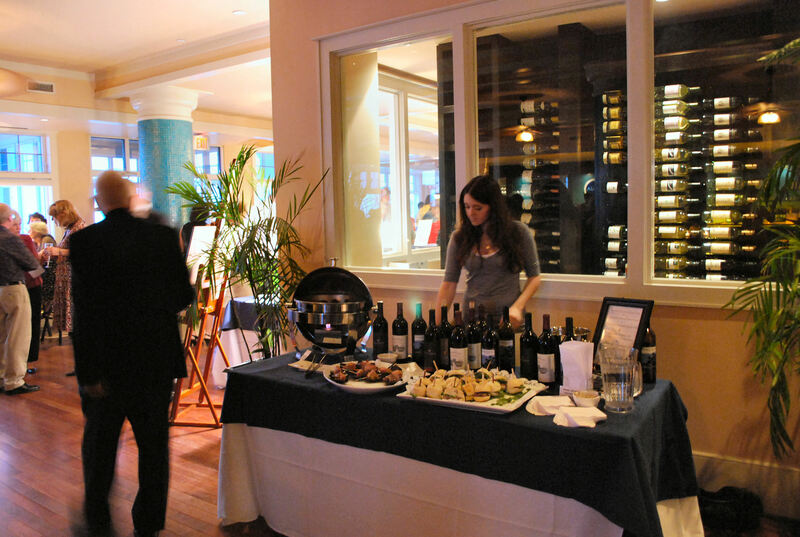 We started at the Cabernet Franc Station, which featured wines from Chatham, Philip Carter Winery and Barren Ridge Winery, enjoying a taste of each and then a half glass of the Chatham to accompany the food. Offerings at the Cabernet Station included beef tenderloin sliders plus one of my three absolute favorites of the evening, mushrooms stuffed with an intriguing mixture of andouille sausage, roasted tomatoes, garlic and bread crumbs, absolutely delectable. Wandering on to the Chardonnay Station, we tried a lightly oaked vintage from Varitas Winery, located near Charlottesville, VA , served with my second favorite food of the evening, a creamy and delicious butternut squash bisque garnished with cinnamon-honey creme’ fraiche. Quite a delectable pairing. Also served at the Chardonnay Station was smoked whitefish on focaccia, which my husband particularly enjoyed. 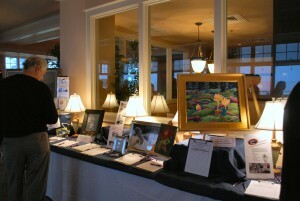 Before continuing on to the Merlot Station, we stopped to peruse the many items on the Silent Auction table– a diverse collection of donated services and travel packages as well as many beautiful items by local artists, including a lovely original acrylic, “Water Lilies” by Thelma Peterson . Also by Thelma was an original watercolor, sure to enliven any room, the very colorful “Oysters Caribbean”, a special “Corks and Forks” auction item. 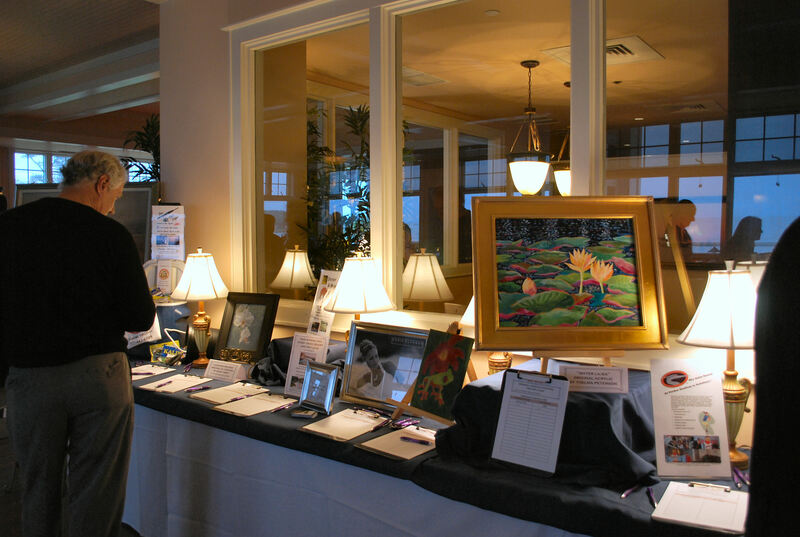 Other interesting art items included a handcrafted leather handbag by well-known local artist, Miguel Bizzotto, a William Turner sculpture entitled “Bronze Otter” and a small table topped with a marble mosaic donated by New Revenna. For sports lovers, there were several bidding opportunities including a Sky Suite at Perdue Stadium, large enough for 20 people, to watch the Delmarva Shorebirds, ( a Single A affiliate of the Baltimore Orioles baseball team), a fishing trip for two on board the Miss Jennifer, plus assorted fishing gear for the trip from Eastern Shore Outfitters and a round of golf and lunch for four at the Eastern Shore Yacht and Country Club in Melfa, VA.
From there, we pressed onward to the Merlot Station, where vintages were presented from Chatham, Rosemont Winery and Veritas Winery. Merlot is among my husband’s favorite wines, although not mine, and he enjoyed a tasting from each winery, enjoyed them all. Nearby, a separate carving station for grilled pork tenderloin served with a fig demi-glaze was doing a brisk business, the pork was fork tender and paired well with both the sauce and the wines. I especially enjoyed the offering of asparagus wrapped in puff pastry, local asparagus grilled to perfection, the puff pastry buttery with just the right crunch, number three on my top food picks of the evening. For seafood lovers, the nearby Viognier Station was the place to be, with plump Virginia’s Eastern Shore seaside oysters the stars of that Station. Served on the half shell, deliciously chilled, nestled into a deep bed of crushed ice, these meaty local oysters are prized for their briny zing, a perfect balance of sweet meat and salty liquor. I’m not really a fan of oysters, my husband prefers them in a rich stew rather than au natural, but for those who love a freshly opened raw oyster, these were prime. Along with the oysters, the Viognier Station offered pastry cups stuffed with a very tasty shrimp salad and crunchy crostini topped with goat cheese and a chutney of olive-artichoke-roasted peppers. The Barboursville Vineyard Viognier was especially fine, I’ve bought it several times when I’ve visited their winery outside Charlottesville, VA , near the foot of the Blue Ridge mountains. Definitely not to be missed, the final station was, you guessed it, the Dessert Station. Featuring a luscious chocolate torte and a very light angel food cake served with a blueberry liquor sauce, it was the perfect ending to a wonderful evening. 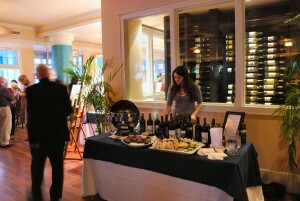 Both a red and a white dessert wine were available for pairing- I tried a taste of both, liked them both. Although in general I prefer red wines, I usually like a very sweet white dessert wine best, no exception here, my husband and I both found the Barren Ridge Vineyard’s offering quite destinctive and delicious. Bravo ! Hats off to Aqua’s Chef Shelly Cusmina and her talented staff, the food was delicious, they really did a superb job ! 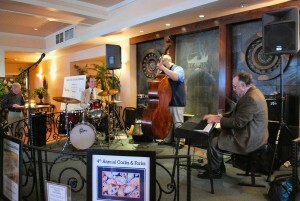 And the ambience of the entire evening could not have been as interesting as it was without the delightful live music of the Russell Scarborough Jazz Trio. I’ve read that the Trio has been voted as “Jazz Artist of the Year” by several regional magazines and it’s easy to see why. 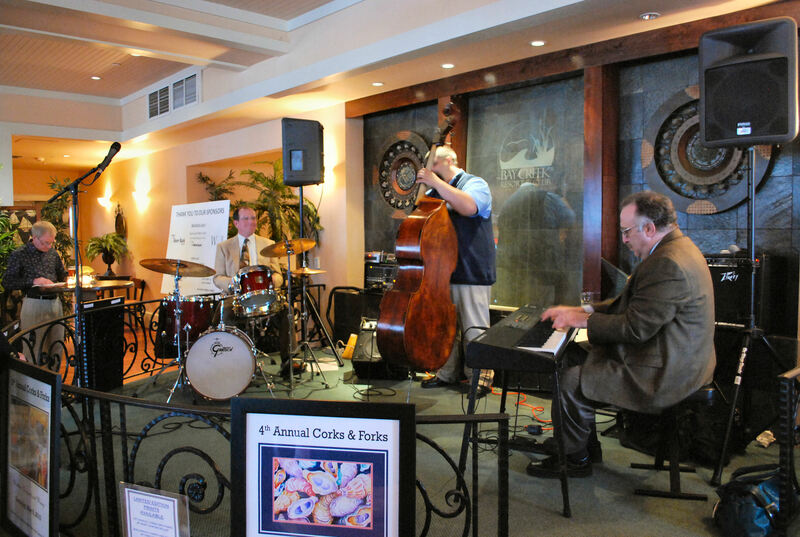 Reminiescent of the George Shearing Trio, their mellow music and elegant piano added so much to the entire event, helping make the 4th annual “Corks and Forks” one of the most successful to date . "3 Cups of Tea" - Buy It, You'll Love It ! 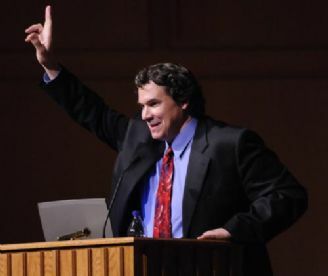 I think of myself as a very practical person and one of the most interesting things, from a practical point of view, about Mortenson’s championing the cause of education in Afghanistan, especially for girls, is that the US military is now taking some of his ideas on relationship building to heart. 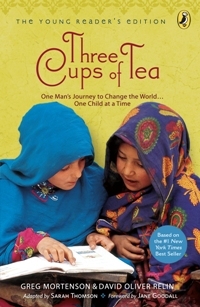 “Three Cups of Tea” has become mandatory reading in U.S. Army war colleges and by the commanders and special forces troops on the ground in Afghanistan. General Petraeus has incorporated Mortenson’s three core principles into the Army’s efforts to win the hearts and minds of the Afghan people– 1.) Listen more and look at issues from their perspective. 2. )Be respectful 3) Build relationships. 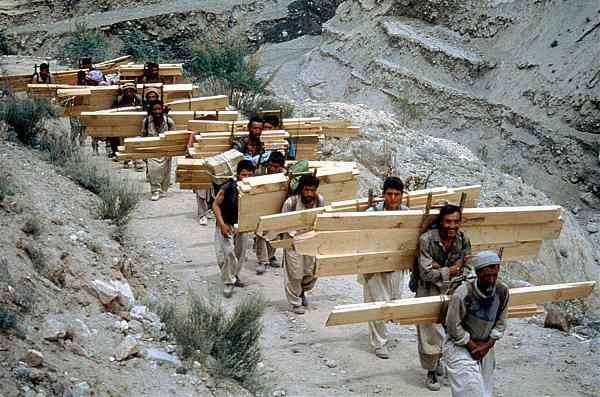 Since the US budget for the war in Afganistan is about 118 Billion per year , clearly everything we can do to win over the people there will help our war efforts. Both General McCrystal and General Petraeus were won over to Mortenson’s principle of working with the elders in the Afghan communities to create the trust needed to achieve the best results and to focus on empowering the Afghan people. Mortenson’s great success has come because the Afgan people in each village where his foundation builds a school must demonstrate their sincere desire for the school, wait their turn for the school to be built and agree to donate the land and all the construction labor before his foundation, the Central Asia Institue (CAI ), agrees to donate the building materials, books and school supplies. 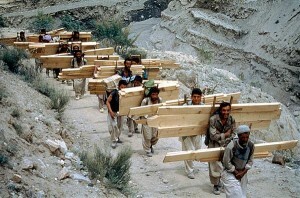 He estimates that it takes up to 8,000 or more man hours of labor to bring in the construction materials, which often must be brought in tied to the backs of the villagers as they climb up the mountains to deliver the materials to their remote villages and to actually construct the school. Because of the huge involvement on the part of the entire village which donates its time and its land, the village becomes so psychologically invested in the concept of having their own school and their children being able to get an education that to date not one village school built by the CAI has been destroyed by the Taliban. 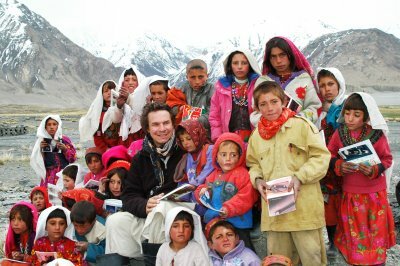 In concert with various villages in high mountainous areas where there have never been schools, Greg Mortenson’s group has built 178 schools in Afghanistan and Pakistan, schools which are now educating 68,000 children per year who would otherwise receive no education whatsoever ! How amazing and life-changing for these children ! Most of the schools CAI has built are are schools for girls. Mortenson’s motto is ” If you educate a boy you educate an individual but if you educate a girl you educate a community”. Mortenson has also been building what he calls “Women’s Literacy Centers” where they educate adult woman on a variety of issues like nutrition and hygeine, etc., provide a wealth of information and skills which they can then take back to their village and pass on to the other women of their village, who then pay to forward to other women, so the information ripples ever outward, helping entire families in these remote villages. Empowerment through education ! Go, Greg, go ! Changing The World, One School At A Time. 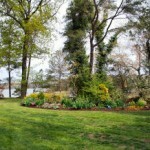 You are currently browsing the Life and Real Estate on the Eastern Shore of Virginia blog archives for April, 2011.